Photo albums are far more than just books of pictures; they're a way of safekeeping our dearest memories. That's why we believe they deserve to be held in only the finest quality materials. Our Italian Wrap Leather Photo Albums are bound in a single piece of black calfskin leather, and available in either 12" or 14" size. Each comes with 30 archival quality, PH balanced and acid free pages; sealed perfectly with neat leather ties. Soft bound in calfskin leather and made in a traditional Italian style, our Italian Wrap Leather Photo Albums are made using one piece of leather which elegantly wraps to the front and ties neatly with leather ties. Perfect in a traditional or a contemporary environment on a side or centre table. Beautiful simplicity ! Each Italian Wrap Portrait Photo Album is bound with 30 archival quality, pH balanced and acid free card pages. 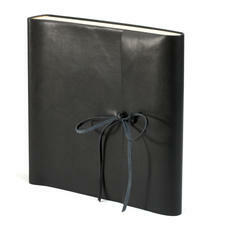 Italian Wrap Albums in 12" or 14" are bound with 50 archival quality, pH balanced and acid free card pages. Interleaving tissue pages also aid to prevent deterioration and preserve family treasures for generations. 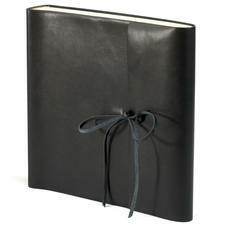 Italian Wrap Albums are perfect for embossing* names, dates and occasions - for a contemporary, less formal appearance. Gold and Silver hot foil stamping is also available.